Amber is a healthy, friendly senior, who ended up at the shelter in 2011 when her owner’s disabilities worsened. She was adopted in November 2011, but recently came back to the shelter because she just couldn’t accept the other kitty in the home. This means Amber will do best as an only cat! Amber will be turning 11 years old in July 2012, and is a very laid-back kitty, who spends most of her time relaxing in her favorite shelter basket. She would be a great companion for a retired person or couple, and could also be a good family pet in a single-pet home. Poor Furby – he was originally adopted from us back in 2005, and joined his perfect family, where he was allowed to sleep in the bed and absolutely loved his life; unfortunately, his family was unable to keep him and also unable to find him a new home, so he was returned to us and we are going to try again. Peanut is a beautiful medium-haired tabby and white girl. She has been with us since early July, when she arrived with her 3-week-old kittens in tow. Peanut has been a great mom, and the kittens are fully weaned – most have already found their forever homes, and now it is Peanut’s turn. Peanut is very friendly and affectionate, and is definitely a lap kitty. She would enjoy pretty much any indoor or indoor/outdoor home, where she can have a lap when she wants one and can have a few short brushing sessions each week to keep that gorgeous coat in great shape. Given a choice, she would rather cuddle than play, so an affectionate family is a must for Peanut. She seems tolerant of other cats, too. 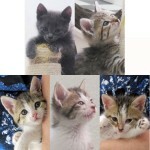 Jupiter and Minerva are tabby and white sibling cats, who were born about 5/1/10, making them just over 1 year old. They were part of 8 cats surrendered by one person, who 2 years ago had 1 cat, but she was an unspayed female – we all know how that goes! Now Jupiter, Minerva, their mom Gizmo, and Gizmo’s brand new litter of kittens are all at the shelter, looking for new homes. (Gizmo and the kittens will not be ready to adopt until mid-June; we’ll list them soon). Jupiter is a pretty outgoing and confident boy who is happy to explore… play with toys… be cuddled… it’s all an adventure to Jupiter. He’d be fine as an indoor or indoor-outdoor cat. Buster is a super friendly and huggable juvenile boy who arrived as a stray. It’s hard to believe no one ever came looking for him, but that means this fantastic cat is ready to become YOUR new best friend. He has a sunny disposition, seems to enjoy the company of other cats, and adores every human he meets. We’ve estimated his birth date as 6/1/10. Can you help Buster find his forever home before his first birthday this June? Janus is a very handsome orange tabby boy who came in as a stray. He is a young adult, probably between 1-2 years old, so we have given him a birth date of 3/1/09. Janus is comfortable with the other cats in his cat room – they are all girl kitties, and they all seem to like this “ladies’ man” cat as much as he likes them! (Yes, they are all spayed/neutered, so it’s not that)! Janus is a bit shy around dogs, but warms up quickly to humans. He would do fine as an only cat, or he should adjust well to having a cat companion or two; he enjoys attention from people, and will make a pretty easy, low-maintenance family pet in an indoor or indoor-outdoor home.